The beloved University of Georgia’s mascot of two years UGA VII passed away suddenly this morning. He was known as “Logan’s Best” and the 56 pound guy was only four years old. is devastated with his passing. 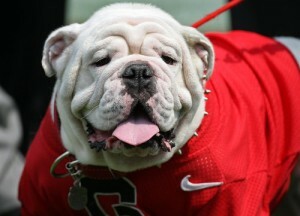 UGA VII will be buried with his predecessors in Sanford Stadium….. If you think he was just a dog, you are wrong…. He wasn’t just a “dog”, he was “The Dog”…. I loved his face and seeing him in that jersey with the big red “G” on it…. He is the face of the University of Georgia and the heart and soul of their football team. and the University in particular. You all know I am not a Georgia Bulldog, but I love that dog…. they look at you with those eyes that pour forth love and devotion and you know the simplicity of love. The simple act of wagging their tail…..
can make the trials and tribulations of a day disappear as you scratch their ears and pat their head. I have poured forth my heart to many a four legged friend over the years…. without offering any unsolicited advice or condemning me in any way. I believe they are God’s gift to mankind…. A creature that symbolizes God’s love for us all….. I don’t know why I went on a ramble here; I just know the Bulldog nation is hurting…. I am hurting with you…. I do believe you are right Jim, they are waiting on us…. Your tribute to UGA VII is awesome! Your words go right to the heart. Here’s to ALL the dogs in heaven!